Tami J. Lee, 58, of Green Bay, departed this life peacefully at her home on Saturday, January 26, 2019. Tami was born on October 20, 1960 in Green Bay daughter of Kenneth Krouth Sr. and the late Yvonne "Voni" (Chosa) Krouth. She was a 1978 graduate of Marinette Catholic Central High School. 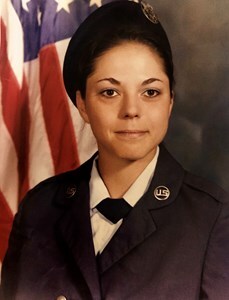 She enlisted in the U.S. Air Force shortly after graduating. She was highly decorated over her 15 years of active duty service working as a Mess Hall Manager. She served during the Gulf War and Desert Storm. While in the Air Force she worked tirelessly to enhance the lives of her fellow service members. She continued her work in food service as a civilian Restaurant Manager for a number of years. Tami was a loving care giver to so many, always putting others before herself. She loved her dogs, Sleepy Do and Piddles. She greatly loved her family, and was a wonderful daughter, sister, aunt, and friend to many. She will be sadly missed by her father, Kenneth Sr., and her siblings: Jill Sindler, Kenneth Krouth Jr., and Jody (Caroline) Krouth. She also leaves her nieces and nephews: Jenalee Alisa and Jake Sindler, Kendra, Megan, and Nathan Krouth and Nicole DeGoey. Tami also leaves numerous extended family and friends. She is preceded in death by a sister, Mickey Pesola. A gathering celebrating Tami's life will be held on Thursday, February 7, 2019 from 4 PM - 6 PM (with food and refreshments) at Newcomer - Green Bay Chapel, 340 S. Monroe Avenue, Green Bay. A service will follow at 6 PM with full military honors to follow. Burial will be private. To leave a message of condolence for Tami's family, please click the Share Memories button above. Add your memories to the guest book of Tami Lee. I'm so sorry to hear about your sister Tami. Please accept my sincere sympathy. I feel sad for you and the losses you have had to go through. Holding you in my prayers. My heart is heavy as I read the unfortunate news about Tami and to also note Mickey. Please accept my deepest sympathy for the loses you have endeared including your Mom. I have only pleasant memories of all three ladies. How time has gone by...……………..